October Ketchup? What does that even mean? Read along to find out. Are you familiar with this feeling where you realize what it is that you want to do with your life? I’m in that state of euphoria where I’ve figured out exactly what my goals are and should be. So, hello guys! How have you been? I’m back from a much-needed blogging break (I’ve been taking too many of them, ain’t I? But it was all worth it, I promise.) and this time I have clear-cut strategies in place. Do you remember the post where I poured my heart out regarding how clueless I am when it comes to where this blog is going? I was in a similar place the last couple of months (again! Duh!) and the self-doubt was wearing me down. It started affecting my relationships and I was always seen in a grumpy mood. | Read: It was a Mistake! But today is different. I am cheerful (I’m actually humming a song right now!) and there are so many things that I want to share with Y’all. All in good time though. For starters, I’m back with hosting Friday Reflections (oh, Corinne was kind enough to look past my hiatus and take me back in) and that means, I get to write for my love for writing. Yes, you heard it right. In this vicious cycle of figuring out a niche for the blog, I had lost it all, especially, my happiness and peace of mind. But I am not scared or overwhelmed anymore. All thanks to the close set of friends I cherish. They offered help and I took their pearls of wisdom into consideration to steer the blogs in the right direction. Enough rants. Let’s bring back the fun ‘Currently in‘ posts, what say? But with a twist. I’d be sharing these as ‘Monthly Ketchup’ on the last Friday of every month. Ketchup because I want that good ol’ Tomato days to stay with me. (New to my blog? This blog was called ‘Tale of Two Tomatoes’ in the initial days before its revamp into Kohl Eyed Me). Also, it is a prompt-free Friday Reflections post. So, feel free to use this template every month to let me know what you’ve been doing. Grab this button and tag me on your post to join Monthly Ketchup. Sounds good? Read… Many books on my Kindle. The best of the lot was Poonachi and it has become one of my all-time favorite reads. You can catch the review here. Played… the Harry Potter Game on my mobile. It’s addictive and my name is Autumn Hill, the loyal Hufflepuff 🙂 Sounds, silly! I know! Watched… To all the Boys I’ve Loved Before on Netflix. I really wanted to read the book series. However, it is ridiculously expensive in India and I had to settle for watching the movie first. It was super cute, all girly and fun. Tried… learning a software all by myself. There is something brewing behind the scenes and I can’t wait to share it with you guys. So, pat on my back, ladies and gentleman. It feels really good learning something new. Ate… lots of greens. My favorite time of the year is here because I get fresh veggies all winter. So, the food was all saag, methi, paalak and the likes. Drank… Moroccan Mint Tea every morning! I am kinda experimenting with different flavors of tea (unlike the usual me who loves her coffee like crazy) and I’m loving it. Do you love flavored teas? Suggest me some of your favorites? Called… my friends! It had been so long since I talked to them, meaning, heard their voices and it was amazing. Pumped me up, y’know? Hoped (to)… stick to my TBR? I had this whole stack of books which I was planning to read, but the month had other plans. I am happy though because as I said earlier, few of them turned out to be great reads! Pinned… 12 tips to stay inspired. Yeah. Seriously! 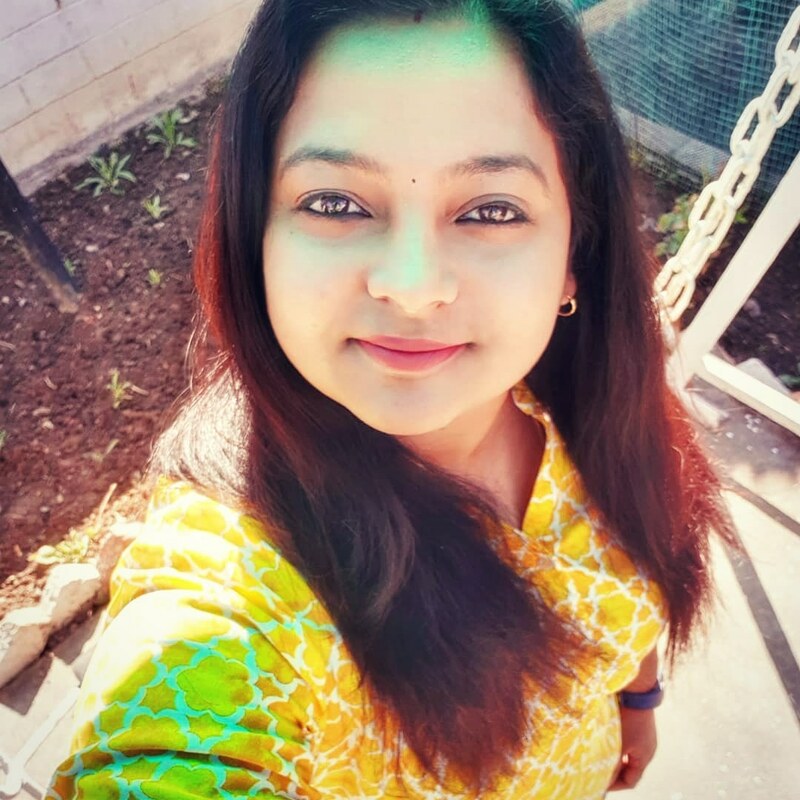 Tweeted… Joined Blogchatter Chat after so long and it felt like home. It was fun interacting with bloggers who I had befriended through this platform. Went… for a walk at night with my furball. You had to see his excitement visiting a new place which overlooked the valley. Loved… that little thing which I did. I felt super proud of myself and it has been so long since I experienced that feeling. Discovered… where my passion lies! Thought… about Blogchatter Projects and how I can utilize the campaign to work towards my goal. Celebrated… Navrathri! We kept books and pen for Saraswati Pooja, I made Vijayadashami special treats for Naivedyam, made a mini-Kerala Sadya, including Payasam. Smelt (of)… Yardley English Lavender. My perfume! Ordered… So so so many books from the Amazon and Flipkart Sale. I also bought Funko Pops and have been addicted to it. Crazily addicted! Thanked… my lucky stars for giving me such a loving blogging family! Considered… taking my food blog to the next level. Ah, spoiler! Started… dancing. For now, it is literally behind closed doors. But I’m glad that I’m taking out some quality time for myself. Finished…hmm..rather, stopped procrastinating! I’m done letting it take over my life. This post was written for Friday Reflections and Monthly Ketchup! I’m also linking up with Chatty Blogs hosted by one of my favorite bloggers, Shantala. Prompts for 26 Oct 2018 –> It’s a free write day! Will definitely “ketchup” with you often 😀 I actually do. Quite liked Poonachi as well. one of the more interesting reads of the year so far. It’s the only one of three PM books I have that isn’t author signed. Loved loved this post and the energy it gave out – all the best with the food blog; you will do something fantafabulous with it! Your book reviews have been great too – loving the bookstagram – those Harry Potter boxes were stunning. I had no clue about the Harry potter game (DUH!!) and your screen name is so you!!! Wishing you a very happy month ahead and waiting to see all that you shall reveal!! Welcome back, Shalu. Really missed you. And this comeback with Monthly Ketchup is fantastic. Hope to read more from you. Nice to see what you’ve been up to. Monthly ketchup is a great idea 🙂 I prefer when blogs don’t have a niche and are a bit more personal anyway. Phew!! so many achievements, I am proud of you. When are you going to post the recipes of chicken pakodas? Awaiting. What a lovely read, Shalini! Isn’t it great to know where you are going? You are amazing, anyway! The “monthly ketchup” (cute name!) format looks fabulous! I wish you all the best. And I look forward to see all the “changes” – here and on your food blog! So you are in a good mood and it’s a nice to see you this way. Happy for you that you are back to writing for the love of it. Enjoyed reading how your October went by especially all the catching up you did with friends and the cooking and celebrating.